For the current administration, see British Indian Ocean Territory. 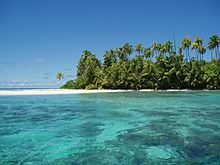 The Chagos Archipelago (/ˈtʃɑːɡəs, -ɡoʊs/) or Chagos Islands (formerly the Bassas de Chagas, and later the Oil Islands) are a group of seven atolls comprising more than 60 individual tropical islands in the Indian Ocean about 500 kilometres (310 mi) south of the Maldives archipelago. This chain of islands is the southernmost archipelago of the Chagos-Laccadive Ridge, a long submarine mountain range in the Indian Ocean. Officially[clarification needed] a colonized territory by the United Kingdom, as part of its British Indian Ocean Territory, the Chagos were home to the Chagossians, a Bourbonnais Creole-speaking people, for more than a century and a half until the United Kingdom evicted them between 1967 and 1973 to allow the United States to build a military base on Diego Garcia, the largest of the Chagos Islands. Since 1971, only the atoll of Diego Garcia is inhabited, and only by military and civilian contracted personnel. The archipelago is about 500 kilometres (310 mi) south of the Maldives, 1,880 kilometres (1,170 mi) east of the Seychelles, 1,680 kilometres (1,040 mi) north-east of Rodrigues island, 2,700 kilometres (1,700 mi) west of the Cocos (Keeling) Islands, and 3,400 kilometres (2,100 mi) north of Amsterdam Island. The land area of the islands is 56.13 km2 (21.7 sq. miles), the largest island, Diego Garcia, having an area of 32.5 km2. The total area, including lagoons within atolls, is more than 15,000 km2, of which 12,642 km2 are accounted by the Great Chagos Bank, the largest acknowledged atoll structure of the world (the completely submerged Saya de Malha Bank is larger, but its status as an atoll is uncertain). The shelf area is 20,607 km2, and the Exclusive Economic Zone, which borders the corresponding zone of the Maldive Islands in the north, has an area of 639,611 km2 (including territorial waters). The Chagos group is a combination of different coralline rock structures topping a submarine ridge running southwards across the centre of the Indian Ocean, formed by volcanoes above the Réunion hotspot. Unlike the Maldives, there is no clearly discernible pattern in the atoll arrangement, which makes the whole archipelago look somewhat chaotic. Most of the coralline structures of the Chagos are submerged reefs. The Chagos contain the world's largest coral atoll, The Great Chagos Bank, which supports half the total area of good quality reefs in the Indian Ocean. As a result, the ecosystems of the Chagos have so far proven resilient to climate change and environmental disruptions. 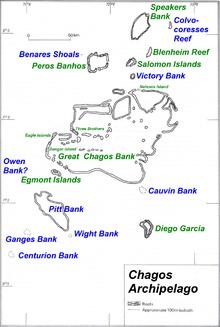 The largest individual islands are Diego Garcia (32.5 km2), Eagle (Great Chagos Bank, 3.1 km2), Île Pierre (Peros Banhos, 1.40 km2), Eastern Egmont (Egmont Islands, 2.17 km2), Île du Coin (Peros Banhos, 1.32 km2) and Île Boddam (Salomon Islands, 1.27 km2). The main natural resources of the area are coconuts and fish. The licensing of commercial fishing used to provide an annual income of about US$2 million for the British Indian Ocean Territory authorities, however licenses have not been given since October 2010; the last expired after the creation of the no-take marine reserve. All economic activity is concentrated on the largest island of Diego Garcia, where joint UK–US military facilities are located. Construction projects and various services needed to support the military installations are done by military and contract employees from the UK, Mauritius, the Philippines, and the US. There are currently no industrial or agricultural activities on the islands. All the water, food and other essentials of daily life are shipped to the island. An independent feasibility study led to the conclusion that resettlement would be "costly and precarious". Another feasibility study, commissioned by organisations supporting resettlement, found that resettlement would be possible at a cost to the British taxpayer of £25 million. If the Chagossians return, they plan to re-establish copra production and fishing, and to begin the commercial development of the islands for tourism. Until October 2010, Skipjack (Euthynnus pelamis) and yellowfin tuna (Thunnus albacares) were fished for about two months of the year as their year-long migratory route takes them through Chagos waters. While the remoteness of the Chagos offers some protection from extractive activities, legal and illegal fishing have had an impact. There is considerable poaching of turtles and other marine life. Sharks, which play a vital role in balancing the food web of tropical reefs, have suffered sharp declines from illegal fishing for their fins and as bycatch in legal fisheries. Sea cucumbers, which cleanse sand, are poached to feed Asian markets. The Chagos Archipelago has a tropical oceanic climate; hot and humid but moderated by trade winds. Climate is characterised by plenty of sunshine, warm temperatures, showers and light breezes. December through February is considered the rainy season (summer monsoon); typical weather conditions include light west-northwesterly winds and warmer temperatures with more rainfall. June to September is considered the drier season (winter), characterised by moderate south-easterly winds, slightly cooler temperatures and less rainfall. The annual mean rainfall is 2600 mm (100 inches), varying from 105 mm (4 inches) during August to 350 mm (14 inches) during January. According to Southern Maldivian oral tradition, local traders and fishermen were occasionally lost at sea and became stranded in one of the islands of the Chagos. Eventually they were rescued and brought back home. However, these islands were judged to be too far away from the Maldives to be settled permanently by Maldivians. Thus for many centuries the Chagos were ignored by their northern neighbours. In Maldivian lore the whole group is known as Fōlhavahi or Hollhavai (the latter name in the Southern Maldives Adduan dialect of Dhivehi). There are no separate names for the different atolls of the Chagos in the Maldivian oral tradition. Portuguese explorers were the first Europeans to discover the archipelago. Although Portuguese navigator Pedro de Mascarenhas (1470 – 23 June 1555) is credited with having discovered the islands during his voyage of 1512–13, there is little corroborative evidence for this; cartographic analysis points to 1532 or later. Portuguese seafarers named the group as Bassas de Chagas, Portuguese: Chagas (wounds) referring to the Holy Wounds of the crucifixion of Jesus. They named as well some of the atolls, such as Diego Garcia and Peros Banhos Atoll, mentioned as Pedro dos Banhos in 1513 by Afonso de Albuquerque. Neglected by the Portuguese, this lonely and isolated group, economically and politically uninteresting, was never made part of the Portuguese Empire. The earliest and most interesting description of the Chagos, before coconut trees grew widely on the islands, was written by Manoel Rangel, a castaway from the Portuguese ship Conceição which ran aground on the Peros Banhos reefs in 1556. 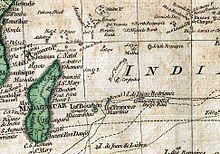 The French were the first to lay a claim on the Chagos after they settled Réunion (in 1665) and Isle de France (now Mauritius, in 1715). 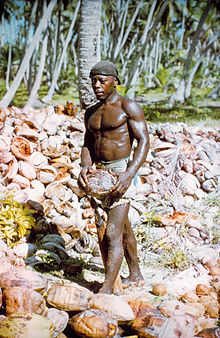 The French began issuing permits for companies to establish coconut oil plantations on the Chagos in the 1770s. On 27 April 1786 the Chagos Islands and Diego Garcia were claimed for Great Britain. However, the territory was ceded to Britain by treaty only after Napoleon's defeat, in 1814. The Chagos were governed from Mauritius, which was by that time also a British colony. In 1793, when the first successful colony was founded on Diego Garcia, the largest island, coconut plantations were established on many of the atolls and isolated islands of the archipelago. Initially the workers were slaves, but after 1840 they were freemen, many of whom were descended from those earlier slaves. They formed an inter-island culture called Ilois (a French Creole word meaning Islanders). Commander Robert Moresby made a survey of the Chagos on behalf of the British Admiralty in 1838. After Moresby took measurements of most of the atolls and reefs, the archipelago was charted with relative accuracy for the first time. Diplomatic cable signed by D.A. Greenhill, 1966, relating to the depopulation of the Chagos Archipelago stating "Unfortunately along with the birds go some few Tarzans or Man Fridays." On 31 August 1903 the Chagos Archipelago was administratively separated from the Seychelles and attached to Mauritius. In November 1965, the UK purchased the entire Chagos Archipelago from the then self-governing colony of Mauritius for £3 million to create the British Indian Ocean Territory (BIOT), with the intent of ultimately closing the plantations to provide the British territory from which the United States would conduct its military activities in the region. On 30 December 1966, the United States and the United Kingdom executed an agreement through an Exchange of Notes which permit the United States Armed Forces to use any island of the BIOT for defence purposes for 50 years, until December 2016, followed by a 20-year optional extension (to 2036) to which both parties must agree by December 2014. As of 2010[update], only the atoll of Diego Garcia has been transformed into a military facility. In 1967 the British Government bought the entire assets and real property of the Seychellois Chagos Agalega Company, which owned all the islands of the BIOT, for £660,000 and administered them as a government enterprise while awaiting US funding of its proposed facilities, with an interim objective of paying for the administrative expenses of the new territory. However, the plantations, both under their previous private ownership and under government administration, proved consistently unprofitable due to the introduction of new oils and lubricants in the international marketplace, and the establishment of vast coconut plantations in the East Indies and the Philippines. Between 1967 and 1973, the entire population was removed from the islands and moved to Mauritius and the Seychelles to make way for a joint United States-United Kingdom military base on Diego Garcia. In March 1971, Seabees, United States naval construction battalions, arrived on Diego Garcia to begin the construction of the Communications Station and an airfield. To satisfy the terms of an agreement between the United Kingdom and the United States for an uninhabited island, the plantation on Diego Garcia was closed in October of that year. The plantation workers and their families were initially moved to the plantations on Peros Banhos and Salomon atolls in the northwest of the archipelago; those who requested were transported to the Seychelles or Mauritius. In 1972, the United Kingdom decided to close all the remaining plantations throughout the Chagos, and deported the Ilois to the Seychelles or Mauritius. The then-independent Mauritian government refused to accept the islanders without payment, and in 1973, the United Kingdom gave the Mauritian government an additional £650,000 to resettle the islanders. However, despite this islanders often found themselves in woefully inadequate housing and living conditions. On 1 April 2010, the British government Cabinet established the Chagos Marine Protected Area as the world's largest marine reserve. At 640,000 km2, it is larger than France or the U.S. state of California. It doubled the total area of environmental no-take zones worldwide. On 18 March 2015, the Permanent Court of Arbitration unanimously held that the marine protected area (MPA) which the United Kingdom declared around the Chagos Archipelago in April 2010 violates international law. Anerood Jugnauth, Prime Minister of Mauritius, pointed out that it is the first time that the United Kingdom's conduct with regard to the Chagos Archipelago has been considered and condemned by any international court or tribunal. Mauritius initiated on 20 December 2010 proceedings against the United Kingdom under the United Nations Convention on the Law of the Sea (UNCLOS) to challenge the legality of the Chagos Archipelago MPA. The issue of compensation and repatriation of the former inhabitants of several of the archipelago's atolls, exiled since 1973, continues in litigation and as of 23 August 2010[update] has been submitted to the European Court of Human Rights by a group of former residents. Litigation continues as of 2012[update] regarding the right of return for the displaced islanders and Mauritian sovereignty claims. In addition, advocacy on the Chagossians' behalf continues both in the United States and in Europe. As of 2018[update], Mauritius has taken the matter to the International Court of Justice for an advisory opinion, against British objections. In November 2016, the United Kingdom restated it would not permit Chagossians to return to their homeland. The Chagos had been part of Mauritius since the 18th century when the French first settled the islands. All of the islands forming part of the French colonial territory of Isle de France (as Mauritius was then known) were ceded to the British in 1810 under the Act of Capitulation signed between the two countries. In 1965, prior to Mauritian independence, the UK split the archipelago from the territory of Mauritius to form the British Indian Ocean Territory. United Nations' resolutions banned the break-up of colonial territories before independence. Mauritius has repeatedly asserted that the British claim that the Chagos Archipelago is one of its territories is a violation of law and of UN resolutions. The United Kingdom has stated that it has no doubt about its sovereignty over the Chagos, but has also said that the Chagos will be returned to Mauritius once the islands are no longer required for defence purposes. The island nation of Mauritius claims the Chagos Archipelago (which is coterminous with the BIOT), including Diego Garcia. A subsidiary issue is the Mauritian opposition to the 1 April 2010 UK Government's declaration that the BIOT is a Marine Protected Area with fishing and extractive industry (including oil and gas exploration) prohibited. On 16 November 2016, the UK Foreign Office maintained their ban on resettlement of the islands. In response to this decision, the Prime Minister of Mauritius expressed his country's plan to advance the sovereignty dispute to the International Court of Justice. The British Foreign Secretary Boris Johnson has sought Indian assistance for resolving the dispute involving the United Kingdom, the United States and Mauritius. India has maintained considerable influence in Mauritius through deep cultural and economic ties. India has maintained that the matter of whether or not to proceed with the UN General Assembly move is a decision for the Mauritian government to make. On 23 June 2017, the United Nations General Assembly (UNGA) voted in favour of referring the territorial dispute between Mauritius and the United Kingdom to the International Court of Justice (ICJ) in order to clarify the legal status of the Chagos Islands archipelago in the Indian Ocean. The motion was approved by a majority vote with 94 voting for and 15 against. On 25 February 2019, the International Court of Justice (ICJ) ruled that placing the Archipelago under British administration in 1965 was not based upon the free expression of the inhabitants and that it thus advised that the United Kingdom should relinquish the archipelago, including the strategic United States military base, for the establishment of which approximately 1,500 inhabitants had been deported. The British government rejected any jurisdiction of the court to deliberate these matters. Structures on the islands are located in the joint defence and Naval Support Facility Diego Garcia, although the Plantation house and other structures left behind by the Ilois are still standing, however left abandoned and decaying. Other uninhabited islands, especially in the Salomon Atoll, are common stopping points for long-distance yachtsmen travelling from Southeast Asia to the Red Sea or the coast of Africa, although a permit is required to visit the outer islands. A Chagossian photographed by a US National Geodetic Survey team in 1969. The islanders were known as the Ilois (one French Creole word for "islanders") and they numbered about 1,000. They were of mixed African, South Indian, Portuguese, English, French and Malay descent and lived very simple, spartan lives in their isolated archipelago working in the coconut and sugar plantations, or in the fishing and small textile industries. Few remains of their culture have been left, although their language is still spoken by some of their descendants in Mauritius. The inhabitants of Chagos were speaking Chagossian Creole, also known as Ilois creole, a French Creole which has not been properly researched from the linguistic point of view. The island names are a mixture of Dutch, French, English and Ilois Creole. The tribes that inhabited the islands were forcibly removed by the US and British governments during the late 1960s and early 1970s—effectively turning the islands into a military base. While a number of islanders had petitioned for the return of their former homes, their efforts have not been accepted by the US and UK legal systems. Outside of the US, the main island of Diego Garcia is the world's largest military base. Diego Garcia is currently the only inhabited island in the Chagos, all of which comprise the British Indian Ocean Territory, usually abbreviated as "BIOT". It is an Overseas territory of the United Kingdom, and the Government of the BIOT consists of Commissioner appointed by the Queen. The Commissioner is assisted by an Administrator and small staff, and is based in London and resident in the Foreign and Commonwealth Office. This administration is represented in the Territory by the Officer commanding British Forces on Diego Garcia, the "Brit Rep". Laws and regulations are promulgated by the Commissioner and enforced in the BIOT by Brit Rep. There are no indigenous peoples living on the island, and the UK represents the Territory internationally. A local government as normally envisioned does not exist. Around 1,700 armed services personnel and 1,500 civilian contractors, mostly American, are stationed on Diego Garcia. As of 2012[update], the islands have a transitory population of about 3,000 (300 British government personnel and 2,700 American Army, Navy and Air-Force personnel). The Catholics are pastorally served by the Roman Catholic Diocese of Port-Louis, which includes the BIOT. The Chagos forms a terrestrial ecoregion together with the Maldives and the Lakshadweep. The islands and their surrounding waters are a vast oceanic Environment Preservation and Protection Zone (EPPZ) (Fisheries Conservation and Management Zone (FCMZ) of 544,000 square kilometres (210,000 sq mi)), an area twice the size of the UK's land surface. The deep oceanic waters around the Chagos Islands, out to the 200 nautical mile limit, include an exceptional diversity of undersea geological features (such as 6000 m deep trenches, oceanic ridges, and sea mounts). These areas almost certainly harbour many undiscovered and specially adapted species. Although the deepwater habitats surrounding the islands have not been explored or mapped in any detail, work elsewhere in the world has shown that high physical diversity of the sea floor is closely linked to a high diversity of species. The biodiversity of the Chagos archipelago and its surrounding waters is one of the main reasons it is so special. As of 2010, 76 species that call Chagos home were listed on the IUCN Red List of Threatened Species. 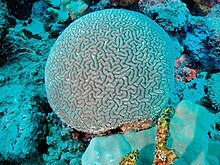 The reefs host at least 371 species of coral including the endemic brain coral Ctenella chagius. 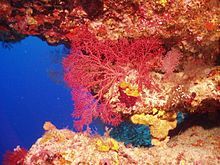 The coral cover is dense and healthy even in deep water on the steep outer reef slopes. Thick stands of branching staghorn coral (Acropora sp) protect the low-lying islands from wave erosion. Despite the loss of much of the coral in a bleaching event in 1998 the recovery in the Chagos has been remarkable and overall coral cover increases year on year. The reefs are also home to at least 784 species of fish that stay near to the shores of the islands including the endemic Chagos clownfish (Amphiprion chagosensis) and many of the larger wrasse and grouper that have already been lost from over-fishing in other reefs in the region. As well as the healthy communities of reef fish there are significant populations of pelagic fish such as manta rays (Manta birostris), whale sharks, normal sharks, and tuna. Shark numbers have dramatically declined as a result of illegal fishing boats that seek to remove their fins and also as accidental by-catch in the two tuna fisheries that used to operate seasonally in the Chagos. Seventeen species of breeding seabirds can be found nesting in huge colonies on many of the islands in the archipelago, and 10 of the islands have received formal designation as Important Bird Areas, by BirdLife International. 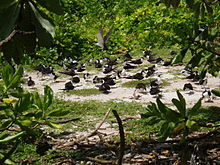 This means that Chagos has the most diverse breeding seabird community within this tropical region. Of particular interest are the large colonies of sooty terns (Sterna fuscata), brown and lesser noddies (Anous stolidus and Anous tenuirostris) wedge-tailed shearwaters (Puffinus pacificus) and red-footed boobies (Sula sula). Land bird fauna is poor and consists of introduced species and recent natural colonisers. Red fody had been introduced and now widespread. Environments of Chagos Archipelago provides rich biodiversity and support varieties of cetacean species within the vicinity, such as three populations of blue whales and toothed whales (sperm, pilot, orca, pseudo-orca, risso's and other dolphins such as spinners, and so on). Dugongs, being locally extinct today, once thrived in the archipelago and the Sea Cow Island was named after the presences of the species. There are also donkeys roaming free on the island that were left behind when the Ilois were relocated. The remote islands make perfect undisturbed nursery sites for nests of green (Chelonia mydas) and hawksbill (Eretmochelys imbricata) turtles. The populations of both species in Chagos are of global significance given the critically endangered status of hawksbills and the endangered status of green turtles on the IUCN Red List. Chagos turtles were heavily exploited during the previous two centuries, but they and their habitats are now well protected by the administration of the British Indian Ocean Territory and are recovering well. 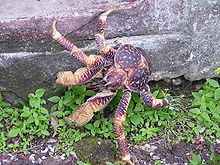 The coconut crab (Birgus latro) is the world's largest terrestrial arthropod, reaching over one metre in leg span and 3.5-4 kilos in weight. As a juvenile it behaves like a hermit crab and uses empty coconut shells as protection, but as an adult this giant crab climbs trees and can crack through a coconut with its massive claws. Despite its wide global distribution, it is rare in most of the areas it is found. The coconut crabs on Chagos constitute one of the most undisturbed populations in the world. An important part of their biology is the long distances their young can travel as larvae. This means the Chagos coconut crabs are a vital source for replenishing other over-exploited populations in the Indian Ocean region. A total of 113 species of insect have been recorded from the Chagos Islands. The Chagos Islands have been colonised by plants since there was sufficient soil to support them—probably less than 4,000 years. Seeds and spores arrived on the emerging islands by wind and sea, or from passing seabirds. The native flora of the Chagos Islands is thought to comprise forty-one species of flowering plants and four ferns as well as a wide variety of mosses, liverworts, fungi and cyanobacteria. Today, the status of the Chagos Islands’ native flora depends very much on past exploitation of particular islands. About 280 species of flowering plants and ferns have now been recorded on the islands, but this increase reflects the introduction of non-native plants by humans, either accidentally or deliberately. Because some of these non-native species have become invasive and pose a threat to the native ecosystems, plans are being developed to control them. On some islands, native forests were felled to plant coconut palms for the production of copra oil. Other islands remain unspoiled and support a wide range of habitats, including unique Pisonia forests and large clumps of the gigantic fish poison tree (Barringtonia asiatica). Unspoiled islands provide us with the biological information that we need to re-establish the native plant communities on heavily altered islands. These efforts will ultimately help to improve the biodiversity of the Chagos Islands. Successive UK governments, both Labour and Conservative, have supported environmental conservation of the Chagos and have resisted attempts to allow the exiled Chagossians to return. They have committed to treat the whole area as a World Heritage site. In 2003, the UK government established an Environment (Protection and Preservation) Zone under Article 75 of the UN Convention on the Law of the Sea. This zone extends 200 nautical miles from the islands. On eastern Diego Garcia, the largest island of the Chagos and the site of a UK–US military facility, Britain has designated the very large lagoon and the eastern arm of the atoll and seaward reefs as a "wetland of international importance" under the Convention on Wetlands of International Importance (the Ramsar Convention). On 1 April 2010 Britain announced the creation of the Chagos Marine Protected Area, the world's largest continuous marine protected reserve with an area of 545,000 km2 (210,000 sq mi). The UK government opened a three-month public consultation which ended after the 5 March 2010 about conservation management of the Chagos Islands and its surrounding waters. On 1 April 2010, the British government Cabinet established the Chagos Archipelago as the world's largest marine reserve. At 640,000 km2, it is larger than France or the US state of California. It doubled the total area of environmental no-take zones worldwide. The protection of the marine reserve will be guaranteed for the next five years thanks to the financial support of the Bertarelli Foundation. The setting up of the Marine Reserve would appear to be an attempt to prevent any resettlement by the evicted natives in the 1960s and 1970s. Leaked US Cables have shown the FCO suggesting to the US counterparts that setting up a protected no-take zone would make it "difficult, if not impossible" for the islanders to return. The reserve was then created in 2010. On 18 March 2015, the Permanent Court of Arbitration unanimously held that the marine protected area (MPA) which the UK declared around the Chagos Archipelago in April 2010 violates international law. Anerood Jugnauth, Prime Minister of Mauritius, pointed out that it is the first time that the UK's conduct with regard to the Chagos Archipelago has been considered and condemned by any international court or tribunal. He qualified the ruling as an important milestone in the relentless struggle, at the political, diplomatic and other levels, of successive Governments over the years for the effective exercise by Mauritius of its sovereignty over the Chagos Archipelago. 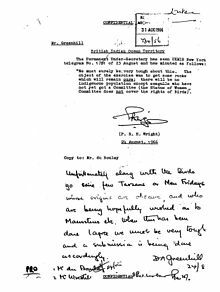 The tribunal considered in detail the undertakings given by the United Kingdom to the Mauritian Ministers at the Lancaster House talks in September 1965. The UK had argued that those undertakings were not binding and had no status in international law. The Tribunal firmly rejected that argument, holding that those undertakings became a binding international agreement upon the independence of Mauritius, and have bound the UK ever since. It found that the UK's commitments towards Mauritius in relation to fishing rights and oil and mineral rights in the Chagos Archipelago are legally binding. The Tribunal also found that the United Kingdom’s undertaking to return the Chagos Archipelago to Mauritius when no longer needed for defence purposes is legally binding. This establishes that, in international law, Mauritius has real, firm and binding rights over the Chagos Archipelago, and that the United Kingdom must respect those rights. The Tribunal went on to hold that the United Kingdom had not respected Mauritius’ binding legal rights over the Chagos Archipelago. It considered the events from February 2009 to April 2010, during which time the MPA proposal came into being and was then imposed on Mauritius. "HMG would like to establish a marine park or reserve providing comprehensive environmental protection to the reefs and waters of the British Indian Ocean Territory (BIOT), a senior Foreign and Commonwealth Office (FCO) official informed Polcouns on May 12. The official insisted that the establishment of a marine park—the world's largest—would in no way impinge on USG use of the BIOT, including Diego Garcia, for military purposes. He agreed that the UK and U.S. should carefully negotiate the details of the marine reserve to assure that U.S. interests were safeguarded and the strategic value of BIOT was upheld. He said that the BIOT's former inhabitants would find it difficult, if not impossible, to pursue their claim for resettlement on the islands if the entire Chagos Archipelago were a marine reserve." ^ a b "British Indian Ocean Territory". www.cia.gov. Retrieved 4 November 2018. ^ "Track of the Calcutta East Indiaman, over the Bassas de Chagas in the Indian Ocean". Catalogue.nla.gov.au. Retrieved 21 June 2012. ^ World Wildlife Fund, ed. (2001). "Maldives-Lakshadweep-Chagos Archipelago tropical moist forests". WildWorld Ecoregion Profile. National Geographic Society. Archived from the original on 8 March 2010. Retrieved 21 June 2012. ^ a b c "Time for UK to Leave Chagos Archipelago". Real clear world. Retrieved 12 July 2012. ^ Nichols, Michelle (22 June 2017). "U.N. asks international court to advise on Chagos; Britain opposed". Reuters. Retrieved 23 June 2017. ^ "Britain should give 'colonised' Chagos Islands back to Mauritius, UN court says". The Telegraph. 25 February 2019. Retrieved 25 February 2019. ^ "House of Commons Hansard Written Answers for 21 Jun 2004 (pt 13)". Publications.parliament.uk. Retrieved 20 October 2013. ^ "US-UK-Diego Garcia (1770-2004)". History Commons. Retrieved 17 July 2014. ^ Christian Nauvel (2007). "A Return from Exile in Sight? The Chagossians and Their Struggle" (PDF). Northwestern Journal of International Human Rights. 5 (1): 6. Retrieved 17 July 2014. ^ A New Comprehensive History of Mauritius Vol 1. Sydney Selvon. pp. 398–. ISBN 978-99949-34-94-2. ^ a b Colonialism: An International Social, Cultural, and Political Encyclopedia. ABC-CLIO. pp. 375–. ISBN 978-1-57607-335-3. ^ Sandra Evers; Marry Kooy (23 May 2011). Eviction from the Chagos Islands: Displacement and Struggle for Identity Against Two World Powers. BRILL. pp. 177–. ISBN 90-04-20260-9. ^ Stephen Allen (16 October 2014). The Chagos Islanders and International Law. Bloomsbury Publishing. pp. 277–. ISBN 978-1-78225-474-4. ^ David Vine (3 January 2011). Island of Shame: The Secret History of the U.S. Military Base on Diego Garcia. Princeton University Press. pp. 92–. ISBN 1-4008-3850-9. ^ "Exiles lose appeal over benefits". BBC Online. 2 November 2007. ^ Will Kaufman; Heidi Slettedahl Macpherson (2005). Britain and the Americas: Culture, Politics, and History : a Multidisciplinary Encyclopedia. ABC-CLIO. pp. 319–. ISBN 978-1-85109-431-8. ^ Laura Jeffery (19 July 2013). Chagos Islanders in Mauritius and the UK: Forced displacement and onward migration. Manchester University Press. pp. 50–. ISBN 978-1-84779-789-6. ^ a b North Sea Marine Cluster. "Managing Marine Protected Areas" (PDF). NSMC. Archived from the original (PDF) on 30 May 2013. Retrieved 5 February 2013. ^ "Chagossians fight for a home in paradise". The Sunday Times. 6 March 2010. Archived from the original on 24 September 2011. Retrieved 21 June 2012. ^ Harding, Andrew (27 August 2018). "Chagos Islands dispute: UK 'threatened' Mauritius". BBC. ^ Bowcott, Owen (16 November 2016). "Chagos islanders cannot return home, UK Foreign Office confirms". The Guardian. Retrieved 26 August 2017. ^ "Mauritius to reiterate its conditions for renewed talks with UK on Chagos". Archived from the original on 23 December 2011. Retrieved 23 December 2011. ^ "Chagos islanders cannot return home, UK Foreign Office confirms". The Guardian. Retrieved 26 August 2017. ^ "Mauritius threatens to take Chagos Islands row to UN court". ^ "U.K. seeks Indian help in resolving Chagos Archipelago dispute". Thehindu.com. Retrieved 26 August 2017. ^ "UN court rejects UK's claim of sovereignty over Chagos Islands". The Guardian. 25 February 2019. Retrieved 25 February 2019. ^ "Chagos islanders cannot return home, says Supreme Court". Bbc.com. 29 June 2016. Retrieved 26 August 2017. ^ "The World Factbook". Cia.gov. Retrieved 20 October 2013. ^ "Diego Garcia "Camp Justice" 7º20'S 72º25'E". Global Security.org. Retrieved 17 July 2014. ^ "Maldives-Lakshadweep-Chagos Archipelago tropical moist forests". Terrestrial Ecoregions. World Wildlife Fund. ^ "A Marine Protected Area (MPA) in Chagos" (PDF). IUCN. Retrieved 2 November 2016. ^ "Concerns about the Chagos Archipelago MPA Proposal". Us.whales.org. Retrieved 26 August 2017. ^ "Dugong dugon, dugong". Sealifebase.org. Retrieved 26 August 2017. ^ Charles Sheppard (14 March 2013). Coral Reefs of the United Kingdom Overseas Territories. Springer Science & Business Media. pp. 278–. ISBN 978-94-007-5965-7. ^ "A Diversity of Decapods". Khaled bin Sultan Living Oceans Foundation. Retrieved 2 November 2016. ^ IUCN Commission on National Parks and Protected Areas (1991). Protected Areas of the World: Afrotropical. IUCN. pp. 341–. ISBN 978-2-8317-0092-2. ^ John Pike. "Diego Garcia "Camp Justice"". Globalsecurity.org. Retrieved 21 June 2012. ^ "Welcome to the Chagos Conservation Trust | Chagos Conservation Trust". Protectchagos.org. Archived from the original on 19 January 2012. Retrieved 21 June 2012. ^ "Consultation on Whether to Establish a Marine Protected Area in the British Indian Ocean Territory". Archived from the original on 6 February 2010. Retrieved 6 February 2010. ^ PA (12 September 2010). "Billionaire saves marine reserve plans". London: Independent.co.uk. Retrieved 21 June 2012. ^ Rob Evans and Richard Norton-Taylor (2 December 2010). "WikiLeaks: Foreign Office accused of misleading public over Diego Garcia | Politics". London: The Guardian. Retrieved 20 October 2013. ^ "Mauritius: MPA Around Chagos Archipelago Violates International Law - This Is a Historic Ruling for Mauritius, Says PM". Allafrica.com/. Retrieved 23 March 2015. ^ "MPA around Chagos Archipelago violates international law – This is a Historic ruling for Mauritius, says PM". Government Portal of Mauritius. 23 March 2015. Retrieved 24 March 2015. ^ "Hmg Floats Proposal For Marine Reserve Covering". Embassy London. WikiLeaks. 15 May 2009. Retrieved 2 December 2010. ^ Cable from AMEMBASSY LONDON; DTG 150700ZMAY09; SUBJECT: Political Counselor Richard Mills for reasons 1.4 b and d.
Padma Rao, Der Edikt der Königin, in: Der Spiegel, 5 December 2005, pp. 152–4. 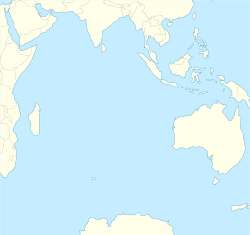 Wikimedia Commons has media related to Chagos Archipelago.